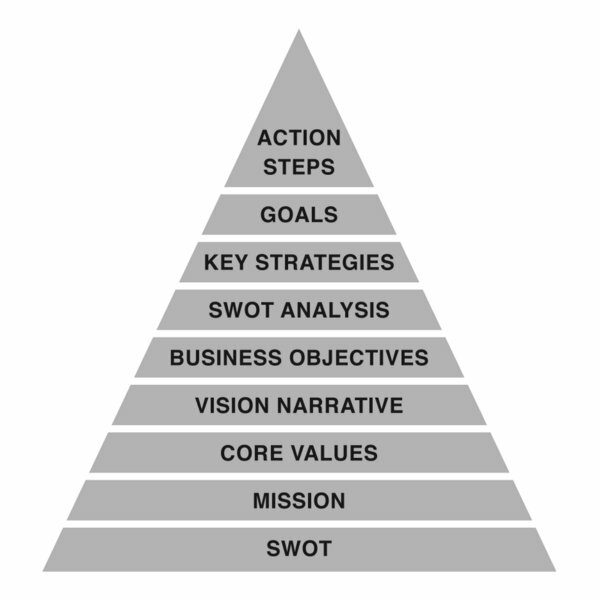 What is the Simple Strategic Plan (SSP) Framework? The Simple Strategic Plan, or SSP, is a tool developed by my friend, mentor, and business partner, Chuck Bowen. He developed it for use in his coaching practice. With his blessing, I adapted and improved it for my coaching clients and wrote the book Conquer the Entrepreneur’s Kryptonite to share it with a wider audience. The SSP is more than just a template. I see it as a framework for being intentional, focusing priorities, minimizing chaos, and getting more done. Why do I call it a framework? Because it is the starting place, not the prescription for all your planning illnesses. You have to do the work of filling in each section, and you can adjust it to fit how you work and how you think. Sections can be added or changed to fit your needs, though I wouldn’t recommend skipping or deleting any outright. By building a solid foundation, each layer supports each other and depends on the layers that come before. If done properly, it creates a perfect alignment from top to bottom, meaning that the tasks you work on each day support your mission, vision, and values. Crafting a short, 90-day plan that aligns with your mission, values, and long- and short-term visions, allows you to begin making positive progress toward your dreams and goals. But it doesn’t end there. Every quarter, you have to review what worked and what didn’t work, then make a new plan for the next 90 days. This cycle repeats over and over again, always pushing you to work on your most important projects…the ones that make your vision a reality. Today the SSP is my primary planning tool. Once I got a solid version of it completed, the quarterly review and updates became much easier to do. I now have a quarterly plan that is broken into weekly mini-plans and tasks. I am focused and getting more done than I ever have before—and I’m working on the most important things first. I wish you all the best as you plan, execute, and share your greatness with the world! It may be a struggle to complete your first SSP and feel confident that it will work. Trust the process. If you stick with it you can have the power and focus to realize your dreams and ideas, and, ultimately, put your potential to work!